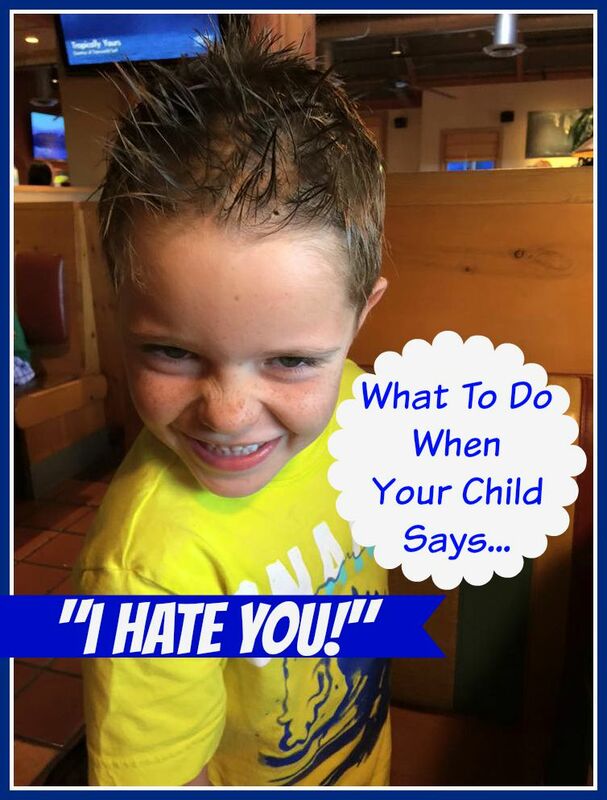 What To Do When Your Child Says "I Hate You!" Hearing the words, “I hate you!” from a child might be one of the most searingly painful experiences for a parent. Whether a son or daughter is 5, or 15, those words bring heartache, often followed in quick succession by anger, and sometimes guilt and doubt about our capabilities as a parent. We may ask ourselves, “How can I be parenting well if my child tells me he hates me?” And if we did succumb to anger and lash back at our child, the guilt mounts. Let me tell you, I consider myself a pretty decent parent with fairly well-behaved boys and even my kids have said that they hate me at one point or another. I get letters on a regular basis from readers who share their own “hate-filled” exchanges with their kids. You are not alone! Don’t excuse the behavior, but do keep in mind perspective by considering the developmental age of your child. Honestly, as adults, we understand the force behind telling someone we hate them. But kids? They simply don’t get it like we do. Are they probably deeply frustrated by a situation? Yes. Are they possibly at a breaking point emotionally? Yes. But the breaking point of a 5 year-old happens when their ice-cream cone falls on the ground. Keep perspective about the true meaning behind your child’s words. It may not be as strong a phrase as you are taking it in that moment. And often, it’s not really about you, so much as a circumstance that is causing them to feel out of control. Immediately choose to be calm in the midst of the storm and get down on their level. Even if they are a teenager and taller than you! In a situation like this, one person is already acting childish. The parent doesn’t need to resort to that same level, but they can get down to their level in a manner of speaking. Calmly look them in the eye, and firmly but lovingly tell them that you understand they are upset, but that words like “I hate you” are simply never to be spoken. Don’t overreact, but speak matter-of-factly and gently, otherwise, you will add fuel to the flame and end up saying things that you regret too. Tell them that even though they are speaking unkindly, that you still love them and you believe they love you too. You may get a “No, I don’t!” back on this one, but say it none-the-less. Children are immature! They don’t have the same ability to compose themselves and use just the right words to express their feelings. They lash out-body and tongue! They resort to “I hate you” but chances are, they really don’t mean it. I promise! And secretly, they don’t want you to believe it either. Telling them that you love them no matter what and that you believe they really do love you too, releases unnecessary guilt from their shoulders and brings them the comfort they are so desperately seeking in all the wrong ways by lashing out in the first place. We are not our children’s enemies. We are their safe places. The ones who will love them unconditionally. This is the best time to show it. Revisit the conversation at a later time when you are both calm. In the heat of the moment, there are a lot of healthy reactions you can have as a parent-walk away for a quick breather, for example. But it’s probably not the time to go into a lengthy discussion as it will fall on deaf ears. At some point later in the day, or even that week, gently approach your child and tell them that you want to talk about the time they said they hated you and explain to them that as a family, we choose to love each other and use kind words to talk to each other, even when we are upset. Assure them that in the future, they can speak to you about what is bothering them but that they simply may never say that they “hate” someone. Reiterate your love for them and their love for you as something that can never be broken, and tell them that you look forward to seeing them use right words to express themselves in the future. Take the time to do a little bit of modeling or role playing as to what that looks like, and then move on. Don’t bring it up again or try to make them feel guilty. This is a time for positive reinforcement and affirmation. Remember to evaluate your weaknesses as a parent for areas of improvement, but don’t wallow in defeat. No parent is perfect. We are all learning along the way, so if you see that something you are doing is exasperating your child, then be honest about it and work towards change, but don’t become helpless with concern over your parenting skills and give up. We don’t want our kids to quit, so we shouldn’t either. Make purposeful changes, take parenting classes, or ask someone for a parenting book suggestion, and think positively about your relationship with your kids. Often, our perspective sets the tone for our homes and when we value our strengths as parents and treat our kids lovingly, even when they don’t “deserve” it, we create the kind of environment where hate hits the road and love lingers. Hey, this post contains a highlighted affiliate link and when you make a purchase via Amazon, they will give me a few pennies at no extra cost to you! Thank you! YOUR TURN! So what do you think? Have you ever heard those dreadful words from your child? What helped you move past the hurt? Which of these 5 points stood out to you the most?